Add-ons extends the features and usability of Internet Explorer (IE) browser with a variety of applications, such as toolbars, plug-ins (e.g. Flash, Silverlight, Java, Adobe PDF Reader), extensions, ActiveX controls and etc. The problem is that the more add-ons are installed, the slower and the messier the IE is becoming. Besides, there are quite a number of programs which behave like an adware just add and install addon to IE web browser during installation, without explicit knowledge or consent of end-user. 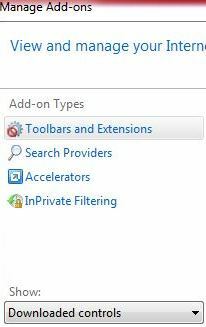 Unfortunately, IE, whether in IE6, IE7 or IE8 does not provide an easy way to remove and delete the unwanted add-ons. In fact, Microsoft only allows the add-ons to be disabled via “Manage Add-ons” menu in IE. According to Internet Explorer: Add-ons FAQ, end-users can only delete ActiveX controls that you have downloaded and installed. User cannot delete ActiveX controls that were preinstalled or add-ons of any kind, but can disable them. As such, for users who want to disable, uninstall, remove or delete a particular add-ons that cannot be removed in Add-on Manager, try the many methods listed below, from the official and recommended version, to unofficial, but sure to remove anything you want version. Most add-ons are installed either by IE itself, or by application programs that has uninstall entries in Add or Remove Programs, or Programs and Features in Control Panel. 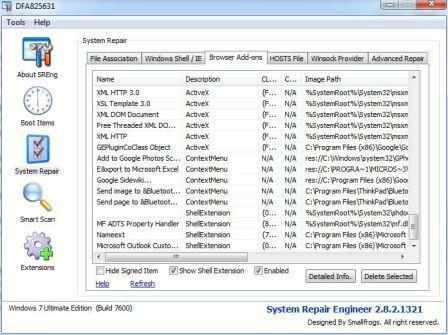 Uninstall the programs that installed the add-ons will normally also remove the associated add-ons. The uninstallation works on most established programs, such as Adobe Flash Player and Adobe Acrobat. Under Show, select Downloaded controls to display all ActiveX controls. Note: You won’t be able to remove other add-ons via this trick, where the Remove button is disabled, unavailable or grayed out. Click the ActiveX control you want to delete, and then click More information. In the “More Information” dialog box, click Remove. Repeat steps 4 and 5 for every control you want to delete. When you are finished, click Close. 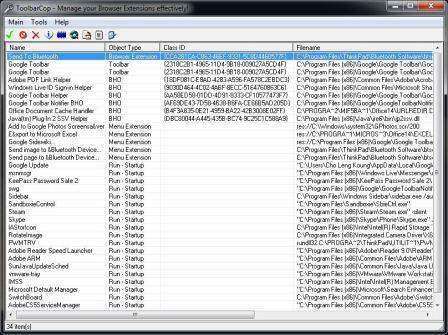 For user who don’t want to uninstall a program as he or she may still want to use the program, but want to remove add-on that is been installed by the program can use third-party programs such as System Repair Engineer or ToolbarCop to remove the add-ons. System Repair Engineer or SREng is a security related software and a system maintenance software that tries to detect some common system issues and most common damages caused by computer virus, where among the most vulnerable components is browser add-ons. System Repair Engineer can detect, disable and delete most Browser Helper Objects (BHO), buttons, toolbars, ActiveX controls, context menu entries, and shell extensions installed on IE web browser. Startup applications originating from RUN registry keys. ToolbarCop has not been refreshed or updated since 2005, but it still works for most IE versions and add-ons. Note that ToolbarCop only delete the registry key that causes the add-on to be displayed on the IE browser, and does not remove the actual physical add-on file itself. So effectively, it only hides or makes the add-on disappear from view.